Twenty-three years ago ten thousand Macht warriors marched into the heart of the Asurian Empire for a contract and a promise, were betrayed, and fought their way back out again. The most famous warrior of the Ten Thousand to still survive is Rictus of Isca, whose name lends weight to any cause he supports and whose personal troops, the Dogsheads, are the most respected soldiers in all of the cities of the Macht. Older and weary, Rictus ponders the day when he can hang up his black armour and tend to his lands. That day will not come soon. A new warleader has arisen, Corvus of Sinon, and he is absorbing city after city into his fledgling empire through the use of new tactics and weapons of war. He asks Rictus to join his army to help him achieve the impossible: the unification of the Macht into one nation. Corvus is the sequel to Paul Kearney's excellent The Ten Thousand, although foreknowledge of that book is not required to enjoy this one. The Ten Thousand was a loose retelling of the Anabasis of Xenophon, whilst Corvus takes the rise of Alexander the Great as its starting point. However, the parallels here are much, much looser, reduced merely to the idea of a young leader with some unusual ideas and unshakable self-belief rising to greatness (oh, and he also has a strong cavalry bodyguard known as the Companions). The focus remains on Rictus, who is the principle POV, although we also get chapters from the perspective of his wife and some of his enemies (most notably Karnos, the ruler of Machran, the most powerful of the cities Corvus covets), whilst Corvus himself remains a somewhat remote figure whom Rictus struggles to understand. Previously Kearney has been compared a lot to Gemmell for his depiction of warfare but also his commentary on glory, honour and heroism, but there has always been a hint of Guy Gavriel Kay (or possibly early Steven Erikson) in his work, particularly his use of tragedy and the mining of characters' emotions to deliver powerful climaxes. 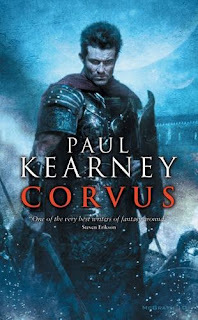 Corvus delves into this side of his writing more deeply than before, delivering several painful gut-punches late in the book which take precedence over the, as usual, excellently-depicted battles and sieges. Kearney also develops his secondary characters well, particularly Karnos whose character evolution in a relatively short span of time is exemplary. The Ten Thousand was my favourite book of 2008, and Corvus (*****) is even better, leaner, more focused, without the slightly predictable ending (The Ten Thousand's sole weakness), and a strong contender for the best epic fantasy work of 2010. It will be published on 26 October 2010 in the UK and USA. I want to read The Ten Thousand as it seems right up my story alley, so it's nice to hear his sequel keeps the good stuff up. These are now on my "to buy" list. Thanks for the review! I hope Paul Kearney finally gets some more recognition. I have read him since Monarchies of God, I fear it was the long delay between the first and final books that made people forget about him (reminds me sadly of J.V. Jones, but unlike Kearney her Sword of Shadows did not get better, rather the opposite). I wish there would be a Hardcover or Kindle version. This series is worth it. I also read (too few) some reviews lately that finally give Kearney the much deserved credit. I like Gemmell and him a lot, it should not be too hard for the Gemmell fanbase to take a look at Kearney's work. I enjoyed The Ten Thousand a lot. Now I wait for my copy of Corvus which must be a great read following your mouth-watering review. In the meantime I will read The Monarchies of God series which has been fortunately re-released in two omnibus. And I highly recommend Adam's review of The Monarchies of God series part one and part two. Thank you to Adam for introducing me to Kearney, who I'd never even heard of a few months ago, and who is now one of my favorite fantasy authors, after reading The Ten Thousand and Monarchies of God. Hopefully his Sea Beggars series is reissued in the states soon, but for now I'm just happy that his books are slowly becoming more readily available, and he's getting more recognition. But the wait for Corvus is killing me!